The Turkish general election on 7 June 2015 will be contested in 85 electoral districts. The districts are not equally sized – neither in terms of seats nor population – although larger districts are represented by more MPs. All districts will vote simultaneously on 7 June, although the race will be more competitive in some than others. Here are the four main groups of districts where JamesInTurkey.com will be watching the race. Safe in yellow – but for how long? 2011 was a good election for the AK Party and particularly here. In 24 provinces, the government didn’t just win – it won overwhelmingly, taking more than 60 percent of the vote. In 2011, this accounted for nearly a third of the seats the party took. Large seats like Konya (14 seats), Kayseri (9) and Kahramanmaraş (8) are safe bets with the AK expected to collect a very health majority. But “safe” does not mean invulnerable. Having the HDP compete as a party rather than field independent candidates means AK will score far less than 60% in Gaziantep (12 seats) and Şanlıurfa (12), while the MHP will mount a challenge in Samsun (9) – and a fair few others too. This is where the battle will be between AK and the HDP. Kurdish rooted parties are traditionally strong in these provinces and this will be the first parliamentary election in 13 years to feature a pro-Kurdish choice on the ballot. There will be some interesting competition to watch with AK in previously safe Gaziantep and Şanlıurfa, which are among the largest provinces in the region, and to a lesser extent in the smaller eastern town of Bingöl (3 seats). 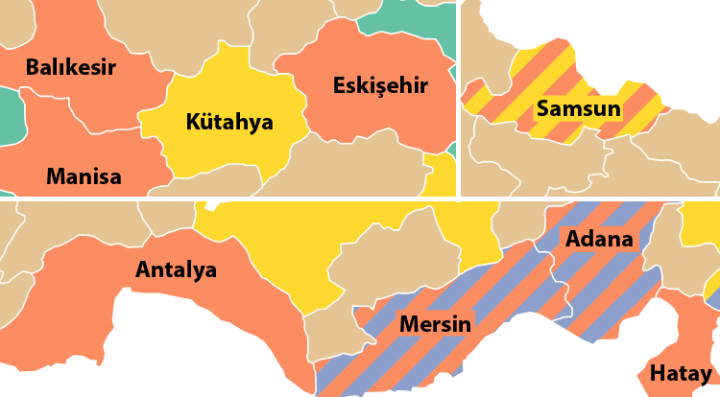 Further west, Adana (14 seats) and Mersin (11) will bundle in the CHP and MHP to deliver fascinating four-way contests as fascinating as Istanbul. 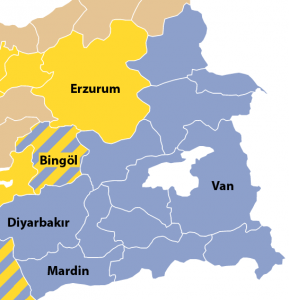 These eight provinces each deliver between 8 and 14 seats and are not dominated by the AK Party. In fact, all the parties can credibly compete in many of them. 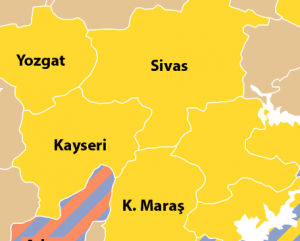 They range from Manisa (9 seats), which was claimed by the MHP in last year’s local election, to Antalya (14), which fell to AK at the same time after a protracted battle with the CHP, and the aforementioned Adana, where the HDP is more influential than many care to admit. Treat these provinces as a microcosm for the rest of Turkey. 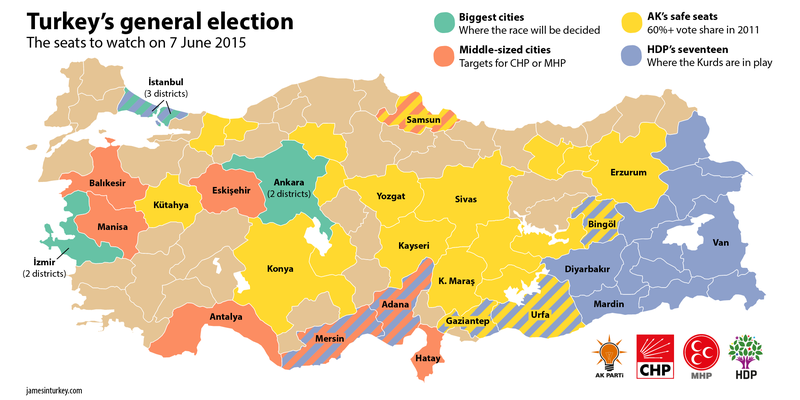 Turkey’s three biggest cities are where elections are won and lost. The rehearsed rule of thumb for Turkish elections is that Izmir votes secular, Ankara votes conservative and he who wins Istanbul wins the country. But there is plenty of reason to doubt that theory because there are more AK voters in Izmir (26 seats) than most will care to admit while Ankara (32) missed out on electing a CHP mayor by only a handful votes – at least, according to official figures. Istanbul (86 seats) is the behemoth where all parties will campaign prolifically. Expect the big three parties each to hold their final rallies here. And don’t overlook the HDP: where it crosses the threshold or not, support for the party will have an impact in all three big cities.